(Nanowerk News) It is well known that neurological diseases and injuries pose some of the greatest challenges in modern medicine, with few if any options for effectively treating such diagnoses, but recent work suggests a unique approach for reconstructing damaged neural tissue. In an article published in the journal Neural Regeneration Research ("Novel advancements in three-dimensional neural tissue engineering and regenerative medicine"), several new designs for 3D tissue constructs are described for using stem cells grown on nanofiber scaffolding within a supportive hydrogel. "The idea that neural structure can be guided in three dimensional hydrogels using nanofiber scaffolding and biochemical cues is quite unique," said Dr. Richard McMurtrey, the author of the work. "Evidence from in vitro work thus far has been fairly surprising, showing that after only a few days neurons can grow long neurite extensions that track along the coated nanofibers." The tissue constructs have been designed for guidance of neural connections, acting like a road map for the growth of the neurons. "One of the weaknesses with prior studies of stem cell implantation into the nervous system is that no guidance is given for what the cells should do once they are implanted," says McMurtrey. "But if we combine signaling molecules and three-dimensional topographical guidance along with the stem cells, the chances of the cells achieving their intended function is much greater." Dr. McMurtrey likens the transplantation of cells into the harsh environment of the nervous system to dropping people off in the mountains with no resources and hoping that they form a functional civilization. "What we hope to do, however, is build some of the roads, bridges, street signs, and homes that can guide and protect the cells when they are transplanted. In this case, that infrastructure includes nanofibers, biochemical cues, and hydrogel composites." Tissue at its most basic level is made of two parts: cells and the matrix outside of cells called the extracellular matrix. The approach discussed in the article seeks to provide both of these components for more complete reconstruction of the tissue. "The idea that neurons need scaffolding guidance along with biochemical signals is not entirely foreign," McMurtrey says. "During early development, precursor cells that will become neurons must migrate along a sort of scaffolding of radial glial fibers in the nervous system, and it is during this process that many anatomical pathways and lines of communication between neurons form." The materials used in building these constructs are compatible with implantation into the tissue of the brain and spinal cord and will biodegrade after a few weeks to months. It is hoped that this will give just enough time to help the implanted cells integrate into the nervous system. Many challenges are expected in the development and implementation of this technology. Nevertheless, there is reason for optimism Dr. McMurtrey says: "Scientists must have a bit of skepticism, but they also need to have vision to try things that haven't been done before. Prior studies have implanted cells in hydrogels without patterned scaffolding and demonstrated better cell survival than when cells were implanted alone, so the idea of combining patterned and functionalized nanofiber scaffolds within protective hydrogels really makes a lot of sense. We know there will be challenges along the way, but we hope to be able to anticipate and overcome the difficulties that will likely arise. 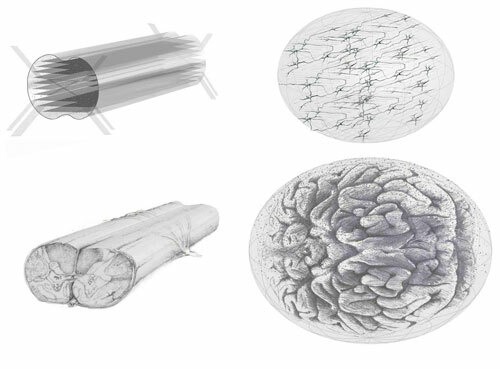 In many ways, this may be like the search for an ideal light bulb--we are looking for the right combinations of nanofiber filaments, hydrogel polymers, and molecular signals that will enable implanted neural cells to connect and communicate across lesions of neural tissue." Much more study will be needed before a patient's own stem cells can be used clinically for things like spinal cord injury, stroke, or neurodegenerative disease, but the first implantation of a patient's own reprogrammed stem cells has recently been performed for a patient with macular degeneration in Japan in 2014 as a collaboration of researchers at RIKEN, one of the world's leading stem cell research centers. Dr. McMurtrey says that much more research and funding would be necessary to bring guided cell therapies into clinical use for neurological diseases, and even then it would not likely be a perfect cure. "The structure and function of the nervous system is more complex than anything else in the universe," says McMurtrey, "so this is not just something like rewiring a circuit board; rather, what we are doing is laying carefully designed pathways through space that neurons can use to reconnect relay centers, but the patient will still have to learn how to use and adapt to these new connections." The technology may also have many applications apart from just regenerative medicine. These applications include constructing and studying simple artificial neural networks, testing new drugs, and investigating models of human neurological diseases on tissue-like structures in a dish. The Institute has successfully created 3D neural structures from a patient's skin cells that were reprogrammed into stem cells ("induced pluripotent stem cells") and then transformed into 3D neural tissue analogs, which opens up numerous possibilities for exploring complex neurological processes and diseases in human cells rather than in animal models. "We hope that this approach will give us new capabilities to guide neural extensions, to study neural functions, and ultimately to achieve functional reconstruction of neural architecture in the brain and spinal cord. Henry David Thoreau wrote that 'We are all sculptors and painters, and our material is our own flesh and blood.' In clinical medicine, the protocols are all spelled out, but there are many diseases and limitations in medicine that move you, that frustrate you, and that inspire you, and I think this is the pi?ce de r?sistance, if you will. Just the chance that this work might help alleviate the long-term suffering of so many people with neurological injuries makes it a privilege to be part of such an endeavor despite all the challenges."